LAWRENCE — Since the dawn of social media, people around the world have used the emerging tool in times of revolution and social uprising. A University of Kansas professor has secured a grant to study the role social media played in protests leading to the impeachment of South Korean President Park Geun-hye and in the 2014 Umbrella Movement in Hong Kong. The findings will help build a theoretical model to better understand the role of social media in social change and anticipate its use in future movements. Hyunjin Seo, associate professor of journalism, has won a $9,000 grant from the Waterhouse Family Institute for the Study of Communication & Society to support her research in investigating social media and collective action. She has begun analyzing social media use during the two movements and conducting interviews with organizers and participants. The first steps will be to analyze content shared during protests of the corruption scandal that eventually led to the downfall of Park Geun-hye and pro-democracy demonstrations of Hong Kong’s Umbrella Movement. While the protests shared many similarities, they were also quite different. The two locations differ in how many people have access to internet and how many connections they have through the internet to other countries across the globe. In Hong Kong, the government made a more concerted effort to suppress social media use and control information, yet citizens were able to use Firechat, a peer-to-peer framework allowing for wireless mesh networking along with other apps and various social media sites to communicate and share information about the protests. Seo’s study will examine how communication infrastructure such as internet connectivity and sociopolitical context such as internet freedom and level of democracy influence the ways people use social media for social movements. In addition to direct interviews with protest organizers and participants, Seo will analyze content shared via social media in the two movements. Twitter, Facebook and Weibo posts will be studied closely, as more data on those platforms are publicly available. Use of other apps and social media channels such as Kakaotalk or WhatsApp will be analyzed to a lesser extent as the interactions shared on them are largely private. Seo, who has previously researched and written about international internet connectivity and government, will analyze how connection to other countries influenced what was shared and how, and how nations outside of the areas of protest interacted with the protesters. That is especially relevant, as recent movements have seen governments attempt to control use of social media by people speaking out against those in power. Censorship in Hong Kong and in Libya during the Arab Spring are recent examples of social media communications from outside the country playing a role in social movements. Other countries, including Russia, China and Syria, have also demonstrated a willingness to use bots and other methods to promote pro-regime messages and suppress anti-government forces. After completing the study of social media use in the South Korean government protests and Hong Kong’s Umbrella Movement, Seo will partner with KU computer science researchers to expand the study to 10 countries around the world to better understand internet infrastructure, social media and collective action. 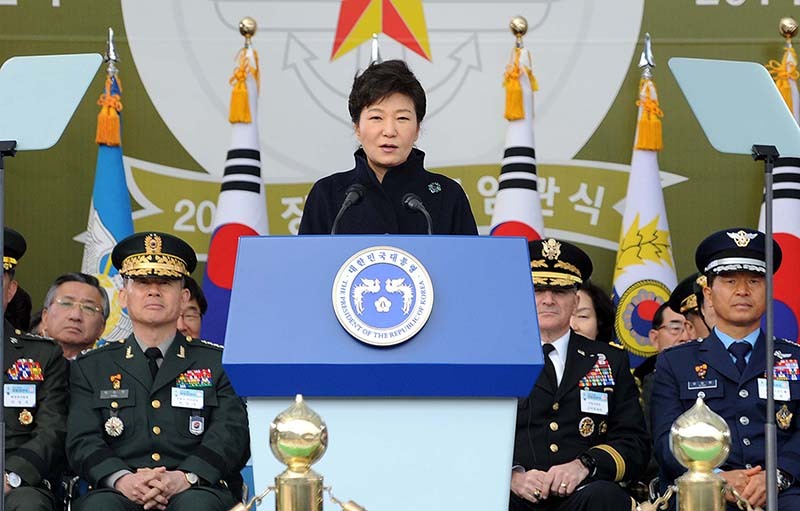 Photo: Former South Korean President Park Geun-hye at a commissioning ceremony. Photo via Wikicommons.